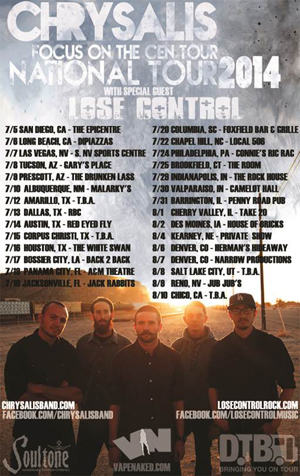 SoCal experimental group CHRYSALIS is pleased to announce their full U.S. Tour with openers LOSE CONTROL, kicking off on July 5th in San Diego, CA. See below for a full listing of tour dates. For this tour, the band looking for assistance from fans and friends! Want to help out? Donate here via IndieGoGo: http://igg.me/at/ChrysalisTour2014/x. The band just recently surpassed their goal of $2,600, a fraction of their overall estimated touring cost (estimated at $12k) which includes tour van maintenance, gas to get to and from city to city, merchandise to sell at their shows, food, equipment, and more. The additional funds will all go to touring costs, thanks to the amazing donations from gracious fans! Everyone that donates, no matter what amount, will have their name featured in print in the album notes of the band’s next record. Donation incentives include signed albums, merch packs, private performances, and signed guitars. 7/12 - AMARILLO, TX - T.B.A. 7/15 - CORPUS CHRISTI, TX - T.B.A. 8/8 - SALT LAKE CITY, UT - T.B.A. 8/10 - CHICO, CA - T.B.A.